Right now we all should have been knee deep in xenomorph carcasses. Aliens Colonial Marines was originally planned for an early June release, but has since all but disappeared from release schedules. Instead we saw publisher Sega choosing to hype up a brand new, and non co-op, Alien vs. Predator title. We feared the worst, thinking the four player co-op shooter from Gearbox was canceled. Thankfully that's not the case. Gearbox president Randy Pitchford has told Kotaku the game is now a 2010 release, and then when the game does release we'll also see a Nintendo DS version. No word on if that version will have co-op or not. "Aliens vs. Predator will be the first to ship out of our triplet of Aliens titles; hence it was shown at this year's E3. We'll have more news to share about the other two games in the near future so stay tuned." Doesn't tell us much, huh? The other game mentioned is the Aliens RPG being developed by Obsidian. We'll all have to wait a bit longer to get our co-op Alien action on unfortunately, hopefully it'll be worth the wait. 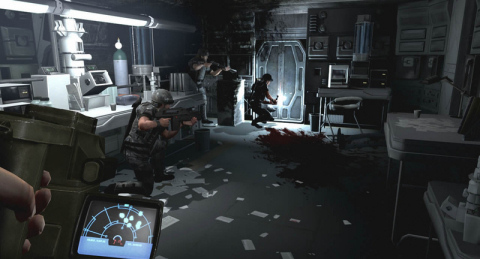 "Aliens: Colonial Marines" Could be the Next "Left 4 Dead"
Is Aliens: Colonial Marines Chest Bursting onto Shelves in 2011 or 2012? Page created in 0.3248 seconds.